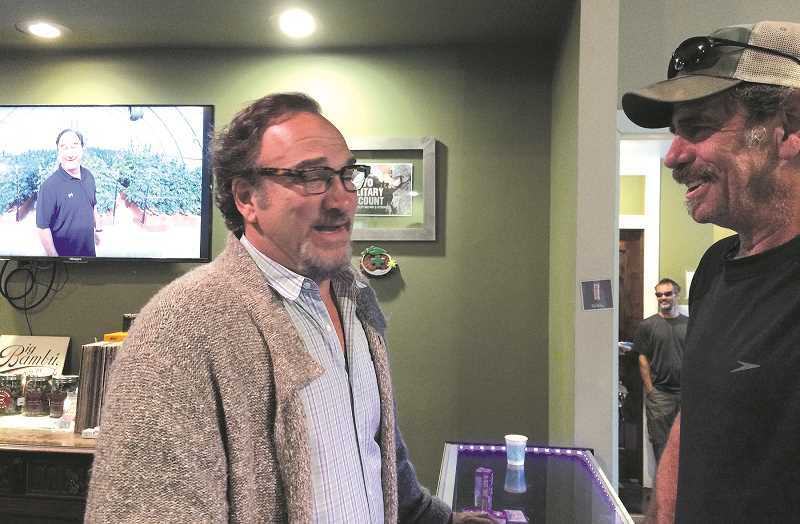 Actor Jim Belushi spent a couple of hours at Today's Herbal Choice dispensary in Molalla on Tuesday, July 3, meeting and greeting a crowd of people from the greater Molalla area. The large crowd filled the dispensary and snaked out a hallway to the back door into the parking lot. This isn't the first time THC has held meetings with farmers. Typically, there's a lot of planning that goes into such meetings, said Kevin Smith, dispensary manager. "We have (the same thing) with lots of different vendors," Smith said. "Typically, they are planned out far in advance to allow these vendors to showcase their materials." Apparently this one turned out much faster. The dispensary announced the meet and greet earlier during the week of the Fourth of July. Turns out, Belushi has a farm in Eagle Point called Rogues Lair, with about 100 acres planted with several different marijuana plants. He currently offers THC at about eight different stands, but has more coming in the pipeline, according to Smith. Belushi continues to live in Los Angeles, but has become quite active with his farm, said Belushi's cousin Chris Karakosta. "He really loves Oregon," said Karakosta. "He just started growing last year," Karakosta told the Pioneer, "and it's in the experimental range." But apparently Belushi likes farming. The actor plans to make a big press announcement in a couple of months about his farm and selling to area dispensaries.